As things keep (slowly) unfolding for me for onematchstick, one of the points that came up a few times is that maybe my previous choice of wording to describe my current offer isn’t quite making it clear what I have on offer. 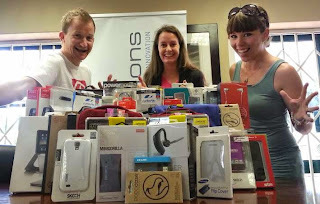 I traded the WONDERboom private rock concert with Rene and Nina for 3 boxes of gear and gadgets – lots of goodies that will take you off the grid! That’s a mantra to live by. It epitomises the philosophy that we want to live a productive, happy life where relationships are a key part. And today technology has evolved to such an extent that it can enhance our life and relationships. And that’s what this is about. Would you like a lifestyle that is less reliant on the grid- especially the electricity grid? Would it be valuable for you to move from a rigid, fixed way of working (stuck to a desk with access to plugs) to a flexible, mobile way of living an awesome life (reliant on the sun’s energy)? That’s what I am offering, a change in your lifestyle – or at least, the chance to have a more flexible lifestyle where you can move around more and not worry about how you will recharge your tech when you need to. So make me an offer and let’s trade! It’s Friday. You found a new recipe for breakfast. You put on the kitchen’s Jabra Revo Headset and clip your ipad into its cover which is next to your stove, to watch the video of the chef giving directions, to get breakfast on the table for your family. You pack the car and set up an educational video to entertain your children, with your iPad ori stand, and giving each child a Jabra Revo headset. You get to catch a late afternoon mountain bike ride with the family, with your go pro camera attached to your bike handlebars with its Joby GorillaPod. An "Off the Grid" Lifestyle. Change your stagnant, office-bound life for a more mobile, flexible lifestyle with these three bundles of gadgets (all tech in the photo above!). This bundle has everything you need for a virtual office that goes where you go, because your office is wherever you are. If you want to work from your home, a café, a mountain top, the airport, your car, or any other moving target, then these accessories are for you. It includes covers for smartphones and stands for iPads, a dualsync cable, stylus pens, car cup holder mount, tripods and stands for phones and cameras for teleconferencing, notebook speakers, Bluetooth headset, adapter lightning to USB cable and 7 port USB hub. Plus the awesome PowerGorilla solar panel for all your charging needs, and Jabro Revo headset. Carry it all in a STM bag. Get active and adventurous with these accessories, including more hardy phone cases, keysync cable as your key ring, more tripods and stands, wireless earbuds, Runtastic heart rate monitor and armband. Also a Powermonkey Explorer solar panel for outdoor charging of your devices, and another Jabro headset. Plus a STM sleeve to keep your tablet safe. From the glow in the dark iPhone case and docking stand, to the Joby Gorilla torch, you’re even set for night time explorations. A mini Gorilla solar panel to power up devices, another stylus pen, Bluetooth headset and a magnetic tripod, amongst more covers, cables, and another Jabra headset too. As well as another STM sleeve to keep your tablet safe. So to have your Off the Grid Lifestyle, make me an offer! What would you trade with me for having the active, on-the-go, adventure seeking and professional lifestyle you dream of, where you get to work and play, spend time with loved ones and make those big deals?